Weather Start +5c Overcast/Gusts of wind, fairly strong at times. After what seemed to be a week of Turkey, Quality Street and Lager i felt the need to get out for a bit of fresh air. As i opened my door at about 7am it was still dark and the wind was blowing quite hard. This would definitely clear the cobwebs away. 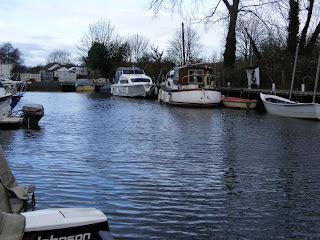 Neil was already back to work so i collected Dean and we headed off to the boat. On the way there i said that it may be too windy to get out and as soon as we arrived it confirmed we would not be leaving the mooring with the wind gusting very strong at times. The tide was fairly low as we loaded the gear on board, with a nice ripple on the water too, this ive found always helps in these shallow dykes. There is really only room to set up one Pike rod each while on the mooring so Dean gets his baited with a live Roach and puts it out at Forty Five degrees. I set the 3mtr whip up and go about catching a few more live baits. I start getting fish instantly but they are very small, only around an ounce at best. Every now and then i do manage to catch one big enough but still only boarder line. Last year i remember catching so many roach "Too big" for bait it was the opposite way round with only the occasional one small enough to use. These fish sizes do seem to go in cycles so looking at these fish today, we should be ok for baits next year. Its only been 15 minutes and Deans bait has been taken and results in a immaculate 6lb fish. I carry on with the bait fishing for another 30 minutes, still catching tiny Roach, Perch and even Ruffe, so give it up as a bad job. I spend the next half hour checking everything on the boat is where it should be and all ok. At around 10:45am Dean has another run, this time on a live Perch. The fish takes line but drops the bait on the strike. I eventually get round to putting a bait out my side, i decide to try a small half of Sardine laced with Smelt oil. The wind has been gusting stronger while we have been fishing and the rigs are getting blown all over the place, not looking very natural at all. Despite this Dean gets another run and is bent into what looks like a better fish. The fish is weaving all over the dyke, cutting the weeds off as it goes. Just as we are about to get a look, it shakes its head as is off. I replace my doctored Sardine with a proper Smelt dead bait and within 5 minutes its taken and i boat a nice 8lb fish. We fish on for another half hour but now the rain has started, which together with the wind, is making it very miserable. We decide to pack in for the day and get everything into the car before the heavens open. Its been nice to get out for this short session, the last of 2011 but i cant wait for our "Normal" days out to resume early in the new year. Ive enjoyed the start to this years piking, still not the big fish we are hoping for but plenty of others to keep us interested. Neil and Dean both increasing their Pbs to double figures as well.